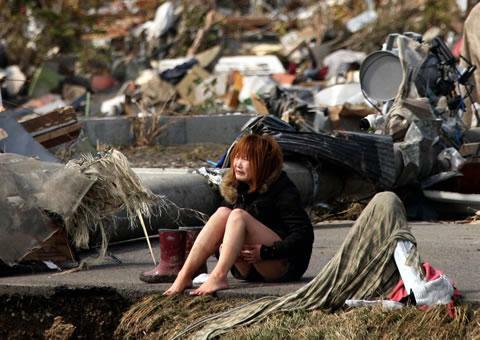 A woman cries while sitting on a road amid the destroyed city of Natori, Miyagi Prefecture in northern Japan, March 14, 2011. The massive earthquake and tsunami that struck Japan Friday was the strongest in the country’s history. Among those caught up in the disaster were Cambodian students currently enrolled in various Japanese universities, who were frightened but otherwise unscathed. Chea Poleng said she had lived in Japan for two years, and though she had felt earthquakes before, they were small in comparison. Friday’s main quake, off the northeast coast of Japan near the city of Sendai, reached 8.9 on the Richter scale and triggered a 10-meter-high wave that swept people away amid cars, ships and homes. Fatalities are estimated in the thousands. Him Sopheak, a Japanese-language student, said he was stuck in a 32-story building in Tokyo’s Sinagawa district. “When the shaking started, we were certainly frightened because we had never experienced such strong tremors,” he told VOA Khmer by phone. There are 350 Cambodians registered with the Cambodian Student Association in Japan, 200 from the Tokyo area. The head of the association, Ly Socheath, said the group was quick to locate its members by phone, e-mail or social media to learn their whereabouts. Ly Socheath said the quake had been light in his area, 30 kilometers outside Tokyo. He had been educated about potential natural disasters on his arrival as a student, and he had faith in Japan’s social services, he said. Japan must now struggle with the aftermath of the quake, which damaged nuclear power facilities and swept entire villages away. Power remains out or intermittent for many in the areas hardest hit, and the death toll has yet to be tallied. On Friday night, one student, Tea Seang Houng, who had traveled to Sendai city ahead of the quake, was at first unaccounted for. Chea Poleng, her friend, said she seven hours after the quake she was still worried and had not heard from her. However, Tea Seang Houng later contacted friends and family to say she was unhurt. Cambodian Embassy officials could not be reached late Friday, but the student association said embassy officials had made calls after the quake to learn the status of the students. On the far southwestern island of Kyushu, far from the areas most affected, Chea Vitcom, a doctoral student at the Ritsumeikan Asia Pacific University and head of the student association’s branch there, said some 50 Cambodian students on the island were fine.